Armed with a shield capable of diverting ballista fires and an excessive spear, the Cyclops Lancers protect their offspring, or at least they think so. They were promised food, wealth and territory for their offspring to direct their deadly instincts to the enemies of Darkness! This Heroes & Monsters box contains a Wandering Monster, 3 Heroes, an Artifact and a new Class for Massive Darkness. A fierce guardian, the Cyclops Launcher is a formidable opponent and her spear is so monstrous that she crosses all the defenses. The Warrior Priest excels in the realm of light rather than shadow, slaughtering his adversaries and supporting his allies with equal fervor. The three Heroes figures provided can be used during your games to replace other characters or add new ones. These figures can also be used with any fantastic medieval RPG. Massive Darkness was funded on the Crowdfunding Kickstarter (See the campaign) platform on the 07 July 2016, the campaign lasted 30 days. 22,361 people helped funded the game, whose the amount requested was $200,000.00. Thanks to these 22,361 people the game could be funded up to $3,560,642.66, ~1,780.32%. Be careful this game is an extension of Massive Darkness and cannot be played alone. 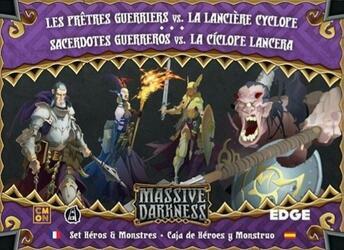 To be able to play it you must have a copy of the game Massive Darkness .